iZotope are held in high regard by the recording industry, their plug-ins are used by producers to create polished mixes, by post production houses to deal with the challenge of large audio projects and more recently by musicians to give them tools to craft great recordings. One such tool is RX, their incredibly powerful suite of tools for helping to fix every sound issue you can imagine. At the heart of RX is the spectrogram, a visual representation of the sound, that those using RX depend on to get right at any part of the sound that needs attention. It includes tools, not unlike those found in Photoshop, such as area markers, paintbrush and eraser to highlight and manipulate the sound. Well some bright spark started to imagine what it would be like if you could use this same technology as the heart of a synthesiser. That idea has now become reality in the form of the new iZotope Iris synth. Let me explain a little more; imagine being able to take a sound, any sound, be that a synth waveform or a sample of a horse giving birth and then be able to manipulate that sound simply by using a paint brush or an area marker on the spectrogram of that sound - well that’s Iris. When I say that’s Iris, that’s the heart of Iris, because this is the core of a sound, called a sample and Iris has three samples and a Sub sample to boot. I think I may have to unpack this a little more for some readers to get their head around it, Iris is what would happen if someone managed to put Photoshop into a sampler - which may sound mad, but after having had a pre-release copy for several weeks, I have to say, it’s the most exciting musical creation tool I’ve seen, or should I say heard, for a long time. Whilst every man and his dog is constantly churning out derivatives of each other’s products, from microphones to reverb plug-ins, iZotope have gone and done something new. Iris ships with over 4gb of content and 500 patches. The content is a vast array of samples with everything from vintage synth oscillators to flying bats - yes really. These samples are the heart of any sound, simply drag one into the spectrogram, do your magic with the provided tools and you have yourself a unique sample. You can use up to three samples, a sub sample and then add envelopes, filters, LFO and effects to make your sound. In typical iZotope style (partly because they have some of the brightest people on the planet working for them) there’s some extra bits of ‘magic’ to help you on your sound creation journey. One technology is called Radius RT which uses time stretching technology to maintain the integrity of a loop irrespective of where is gets played on the keyboard (within a user determined range). It can take some thinking to get your head around the concept, but once you do, then it gives a new weapon in the sound creation arsenal. 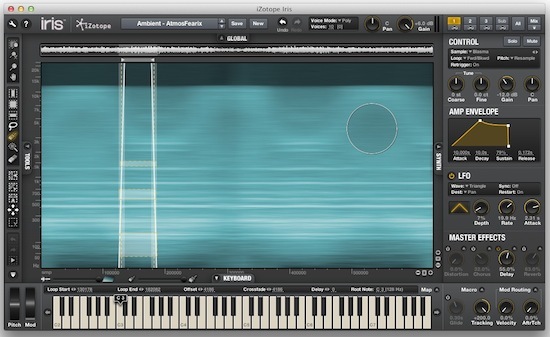 iZotope ships as both standalone and also as RTAS, VST and Audio Units plug-in formats. I understand AAX is coming sometime later down the road. When you first start working with Iris it can take a little getting used to, at this point I make a shameless plug for my new ‘Iris Explained’ Series from Groove 3. This will get you up and running in less than 3 hours. Once you have grasped the new concepts of the Iris sound design philosophy, then you’ll soon be making sounds. I recommend some simple single sample sounds to start with, this will help you fully grasp the heart of Iris. Then go deeper into adding more layers, sub, filters and everything else. The supplied library is plentiful, just as the patch library is too. The effects are a smart choice of distortion, chorus, delay and reverb, with plenty of knobs to tweak. The effects work in two different ways within Iris, this depends on if you choose send or master effects, this adds another dimension to the sound design toolbox. Control and automation is plentiful in the form of assignable modulators, macros and MIDI learn, all of which are relatively easy to set up. I’m guessing you realise that I’m somewhat excited by Iris, that would perhaps be an understatement - partly because until you’ve used Iris you simply can’t imagine working with sound in this way and furthermore hearing what emerges from what I can only describe in some cases as ‘audio graffiti’. It puts sound design and synthesis in the hands of the masses, not by dumbing down, but by making an elegant and wonderfully powerful interface so damned fun and intensely gratifying. If I have any gripes they are minor ones and mainly centre around the file management of patches, macros and effects. This doesn’t detract from any of the enjoyment and sound making potential, it’s just silly to have to find workarounds so you can create effects presets or organise patches - having been working closely with the development team I know that all these things are on their radar. A ‘nice to have’ would have been surround outputs, mainly because I can see Iris being in the hands of every composer on the planet by this time next week, again I’ve put that on iZotope’s radar. In the meantime, there’s no doubting that even a stereo Iris is a lot better than a lot of the stuff out there. Iris is priced at $249, which is a steal - I even understand there’s a 14 day promo for early adopters to pay $149 for it. May I suggest that you buy it now, if you can’t afford it then sell your bed or your dog - this baby is going to be big and deservedly so. In an industry full of endless derivative products iZotope have broken the mould, they deserve my cash simply for being so imaginative and bold. Now here’s a challenge to every manufacturer out there, right now iZotope Iris gets my Editors Choice Award, unless someone does some magic then it’s going to get my 2012 Product Of The Year Award too! Anyway, I’m off to sample the dog and turn him into a bass synth.